Blondie and Brownie: Ham & Cheese is Back at Pret! Ham and cheese are natural sandwich partners. They just belong together. But last month Pret made their ham baguettes dump cheese in favor of mustard. Well, fortunately it seems Pret has seen the error of their ways. 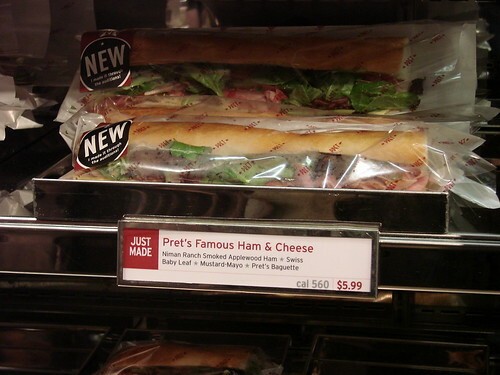 Last week I spotted "Pret's Famous Ham & Cheese" back in the sandwich case with a "new" sticker. I hope that it's back for good. Meanwhile, I've been noticing that the Coronation Chicken sandwich has been making occasional appearances in the Pret at Rock Center. I've seen it only on two occasions thus far. Both times they had limited quantities and it was shelved with the weekly specials. For the uninitiated, coronation chicken is a curried chicken sandwich that's wildly popular in the UK. Legend has it that coronation chicken was invented for Queen Elizabeth II's coronation. Whatever its origins, coronation chicken makes for a bloody lovely sandwich. Throughout the UK coronation chicken sandwiches are widely available, including in the chill case at pharmacies and grocery stores. It's a very tasty take on chicken salad and I hope that it makes it back into the regular rotation at Pret. In the meantime, you can satisfy your craving by following this recipe from the UK Pret site to make their coronation chicken at home.